Kheris Rogers was in the first grade. She was in private school. Her classmates were mostly white. It was in Los Angeles. She felt the bite of racism among her peers. She was being bullied. She was bullied because of her dark skin. She tearfully kept it to herself. She eventually turned to her older sister. Her name is Taylor Pollard. Kheris switched to a more diverse school. There, colorism among fellow African-American students surprised and confused her. Her young sister's self-esteem was bruised. Then Taylor inadvertently launched Kheris to social media fame. That was in 2017. She posted a photo of the girl. She posted it on Twitter. She was dressed up for a fashion show. She used their beloved grandmother's down-home words for a hashtag. It was "#FlexinInHerComplexion." Kheris soon had her own Twitter. She had Instagram. They are @KherisPoppin. She was posting photo shoots of herself. She created them with Taylor. Her own fashion line followed. This included T-shirts. They sported her tagline, "Flexin' in My Complexion." Then came backpacks. They read "The Miseducation of Melanin." She also created other apparel. And she made accessories. Lupita Nyong'o posted a photo of herself wearing a black version of the shirt. It displayed bright yellow letters. She was supporting of Kheris. Whoopi Goldberg sported one. She was attending the Rodarte show. That was at New York Fashion Week. That was in September. Alicia Keys lauded her black girl magic. The words of her tormenters no longer sting. But they haven't been forgotten. The behavior wasn't restricted to children, either. "The kids would always call me names." Kheris is 12 now. That is what she told The Associated Press. "They would always tease me for my dark-skin complexion. They used to call me dead roach. They'd say I've been in the oven too long. When I really knew I was being bullied because of my color was when my teacher handed me a black crayon instead of a brown crayon to draw our portraits for parent conferences." Taylor is 24. She is now Kheris' manager. She suspected something was amiss. Then Kheris finally told her family. She is now in middle school. Things are more than just a little looking up. Kheris was chosen as one of Teen Vogue's "21 Under 21" inspiring girls and femmes of 2018. She attended the magazine's teen summit. She was picked by LeBron James as one of 16 people to help mark his 16th shoe release with Nike. She modeled in ads for the company. She's been featured in a spread in Essence magazine. She walked the runway of "America's Next Top Model." That came after Tyra Banks learned of her plight. She has shown her own line in Harlem. That was during New York Fashion Week. And she hasn't even hit the eighth grade yet. Julee Wilson is fashion and beauty director for Essence magazine. She called support for Kheris "both an honor and responsibility." Her mom is Erika Pollard. She is a social worker. She said Kheris travels the country speaking at conferences about empowerment. Kheris now has lots of friends as a seventh-grader. 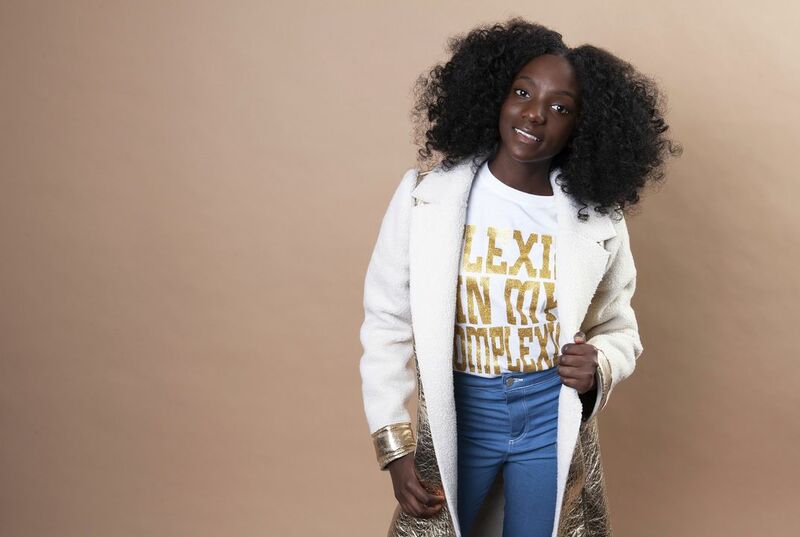 She knows exactly how to handle bullies: "Back off because I'm flexin' in my complexion and it doesn't matter what you think about me. It matters what I think about myself." I think people should not be bullied by there skin color because i think its rude. And people should be nice.